I just harvested some of my rhubarb - I don't have a huge patch, but this is the third year so I think my plants will yield quite a bit. I have a lot of favorite rhubarb recipes, but it's always fun to try new things as well... and I wanted something portable, for an all-day visit to the zoo. This recipe originally had fresh mint in it, lots - but I didn't have any, and I wasn't so sure I would like it, so I decided to add in white chocolate instead. It was a super dry mixture, so I also added some filmjolk - use buttermilk instead if you'd like, or yogurt. I bet milk would work just as well. It's just to make it a little more batter-y, and less dough-y. The finished muffins are amazing! They keep well too, and are nicely moist and tender inside. Titus didn't like the actual rhubarb pieces and picked them out as well as he could, but everyone else loved the combination of tart rhubarb and sweet white chocolate. Highly recommended! Start by prepping the rhubarb, and grinding the almonds. Add the buttermilk, flour, baking powder and vanilla sugar, and finally stir in the rhubarb and the white chocolate. Divide into lined muffin tins. Bake at 200 for 12-15 minutes, until golden and dry inside. Rhubarb and mint sounds like such an unusual combination - but I think your white chocolate ones sound nicer! Liga - Furuvik! It's pretty far but was worth the drive. 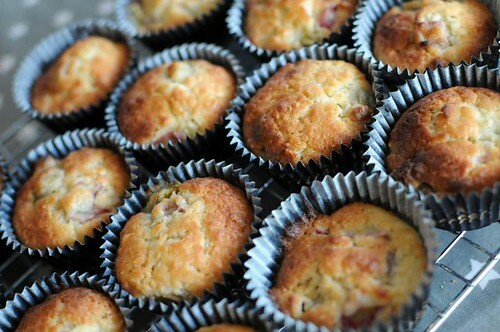 I made the muffins last night and they are very yummy. I was worried they would be too sweet but they were just right. I just made these. They are delicious. I used my left-over yoghurt (berry flavour) which only added to the delicious taste. Only one of the four children picked them to bits, eating reluctantly. Thanks for a great recipe.